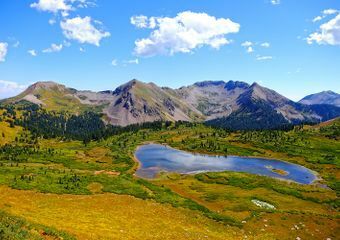 When many readers of this site think about taking a thru-hike, I imagine they dream about completing one of the “big three” of America’s long trails: The Appalachian Trail, Pacific Crest Trail, or the Continental Divide Trail. But if you’re not on the trail yet, or deep into final preparation, it probably isn’t going to happen this year. Perhaps the budget wasn’t there, you couldn’t quit that job, or leave that significant other for that long. However, you can still take an epic, life-changing thru-hike this year. In fact, there’s even a “Triple Crown” that can not only be contemplated, it can be accomplished without having to jeopardize your career and/or relationships. 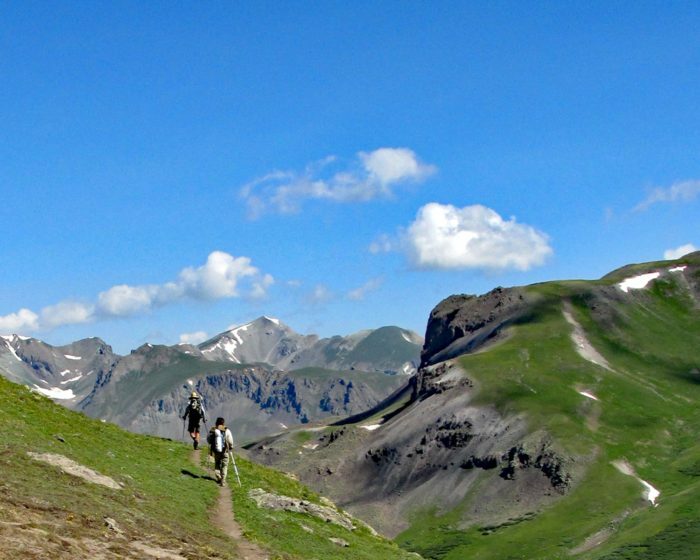 That’s right, there’s a junior version of hiking’s “Triple Crown.” What I’m talking about is replacing the AT with the Long Trail, CDT with the Colorado Trail, and PCT with the John Muir Trail. All three of these trails share some distance with their longer, more famous versions, and you get the compact taste while still undergoing an epic adventure. And let’s be real— a 273, 486, and 210-mile trail is no joke. As a guy in his 50’s with a mortgage, pets, and titanium in one foot, I didn’t even consider the AT, PCT, or CDT. My Triple Crown began with the 486-mile Colorado Trail. It shares nearly half its distance with the Continental Divide Trail, and travels through of the most beautiful scenery of the Rockies. It turned out to be a tremendous, month-long experience and inspired me to hike all three trails. For those with weeks, not months, available to hike; I highly recommend these trails. 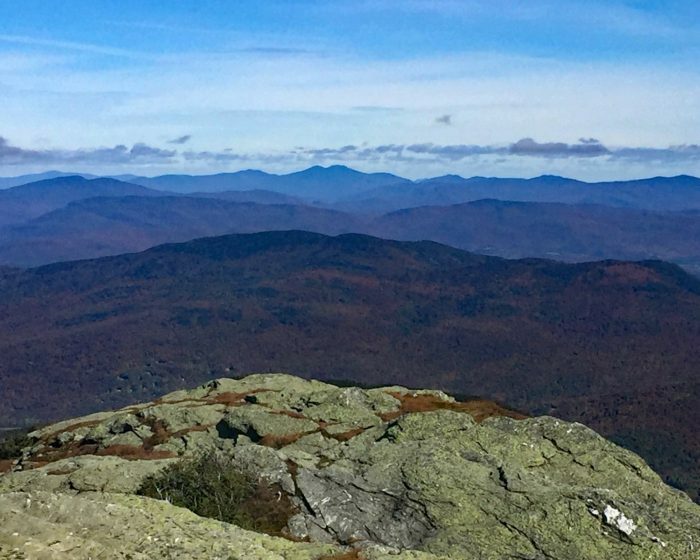 The Long Trail is 273 miles of classic eastern mountains. Vermont’s “footpath in the wilderness” is the oldest long distance hiking trail in the country and was not only the inspiration for the AT, it shares nearly half its distance with its more famous cousin. 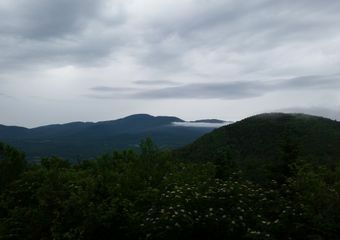 Because the trail runs the very spine of Vermont’s Green Mountains, there are a surprising number of big views. Besides the bare peaks of Camel’s Hump and Mt. Mansfield, several other mountains crossed are ski resorts in the winter. The cleared ski slopes reveal more scenery than typically found on other eastern mountains. Quite often the views also include a beautiful small town nestled down in a valley. One such spot is Stratton Mountain. 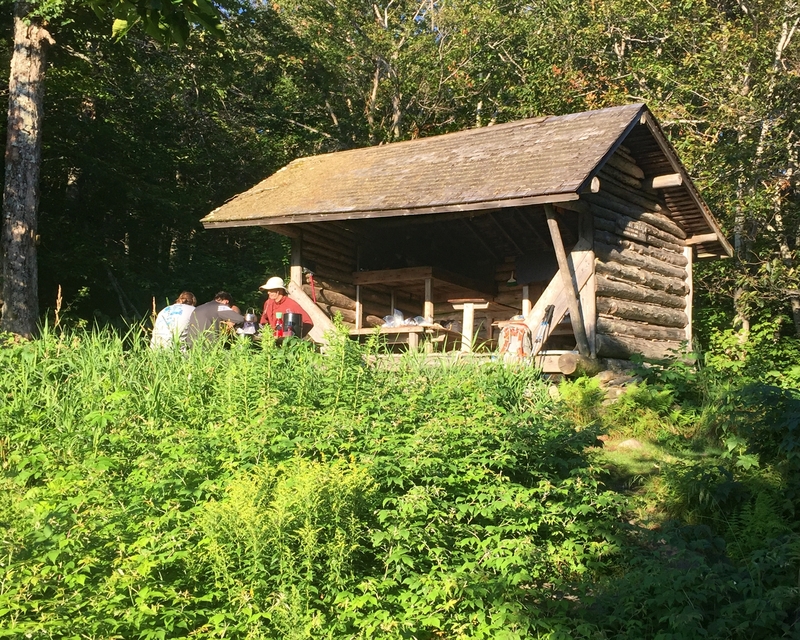 It was there that Benton McKaye conceived of the idea of the Appalachian Trail. The southern 100 miles of the trail are perfect if you are looking for an AT-type experience. In fact, that stretch the trail is shared with the AT. There are numerous shelters, plenty of company and nearby resupply. Once north of the split however, the trail is significantly more challenging. The crowds disappear and the hiking gets much more rugged. There were many slopes where hiking involved climbing ladders or metal rungs drilled into rock walls. There were spots where I saw blazes and thought someone had to be kidding. It was on the LT that I realized that hiking could be an adrenaline sport. Oh, and the famous “Vermud” does exist. 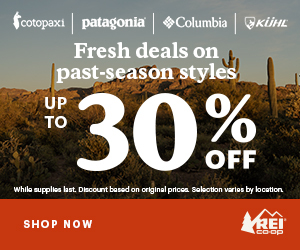 If just going backpacking is not enough of a challenge, the Long Trail is for you. Designed to be accessible by horse (no ladders! ), the trail is well constructed and maintained. There are no shelters along the way, so a tent is a necessity. With the average elevation over 10,000 feet, the trail spends extended stretches above tree line (with no spots to hang a hammock). Altitude is a significant consideration, as snow can remain well into the summer months and afternoon thunderstorms are a real danger. Despite some rain and hail during my 29 days on the trail, the sun shined at least part of every day. Don’t expect crowds on the CT. Hikers need to be self-sufficient on this path. In the more remote sections I was more likely to see a marmot on the trail than another hiker. Convenient resupplies can be far apart. I typically hiked 70-100+ miles between town stops. Beyond the aforementioned marmots, wildlife is prevalent on the trail. While hiking, smaller critters were abundant, plus the occasional deer, bighorn sheep and elk. 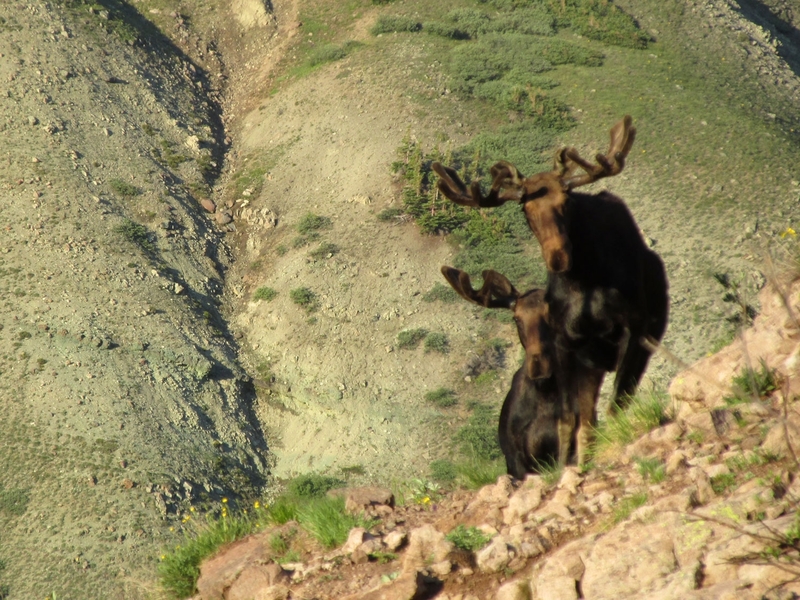 Where else would you need to share the trail with two bull moose at 12,000 feet? While I didn’t see any, there are black bear near the trail. Big scenery, high altitude and seclusion were the hallmarks of my hike. The 210-mile John Muir Trail (JMT) shares 170 miles with the Pacific Crest Trail, and by many accounts is the most scenic section of the PCT. The path travels from Yosemite National Park to Kings Canyon National Park, through the Sierra Nevada Mountains, to the top of Mt Whitney. The scenery in the Sierra is just spectacular, earning the label of “The Range of Light” from John Muir. The trail is full of iconic views such as Half Dome, Cathedral Peak, Evolution Valley, and several high passes. Despite hiking during the 2015 drought, water was never an issue. Much of the trail appeared very dry, but melting snow kept countless clear creeks flowing and abundant alpine lakes reasonably full. There is only one mountaintop view, but it’s outstanding. At 14,505 feet, the summit of Mt Whitney is both the official endpoint of the JMT and the highest point in the continental United States. On a clear day, the view goes on seemingly forever. 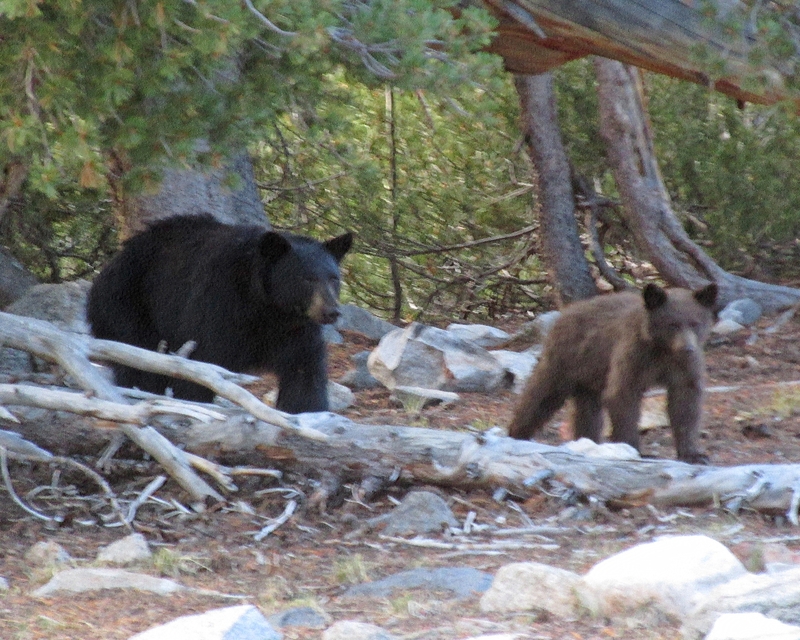 As the entire trail is within either National Parks or wilderness areas, the wildlife sightings were incredible. Deer were plentiful through the lower elevations and seemingly oblivious to hikers. Most impressive to me were the close encounters with predators. I stumbled within feet of coyote and even a bobcat. Multiple encounters with bear left no doubt as to why bear-resistant canisters are required. Like the CT, the JMT has high elevations and big climbs. The hike crosses 11 passes before the final climb up Mt Whitney. However, also like the CT the JMT is well constructed with switchbacks when prudent. 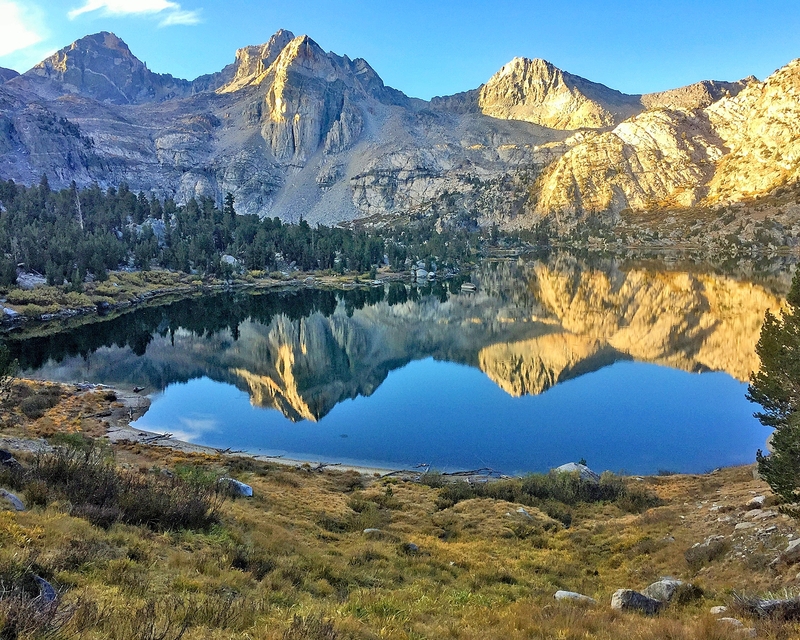 Beyond the topography, the JMT provides some additional challenges. Resupplies go from easy to nearly non-existent as you travel from north to south. 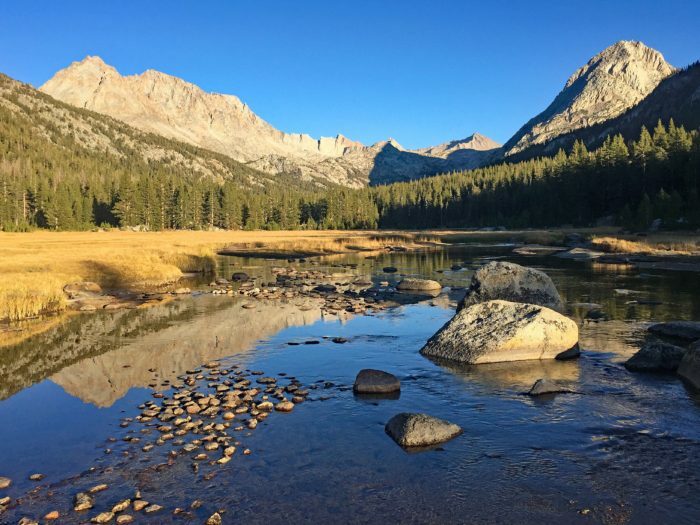 The last relatively convenient resupply option is at Muir Trail Ranch, halfway through the 220-mile hike. (Yes, I know the trail is 210 miles, but you still have to get off Mt Whitney.) Stuffing enough calories into my bear canister to supply 110 miles of hiking was interesting to say the least. It involved some tough choices as well as standing on the lid before it would close. 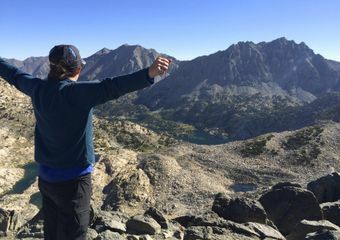 Perhaps the biggest challenge with the JMT is just scoring a permit. If you want to start in Yosemite, plan on faxing in an application 24 weeks before your planned start date. By the end of the day, you will find out if you were successful. You probably were not. Apparently, there is such demand that over 97% of all applications are denied. One hiker I met on the trail had been denied 22 times before she received a permit to start at Happy Isles Trailhead. The National Park Service is in a difficult position. 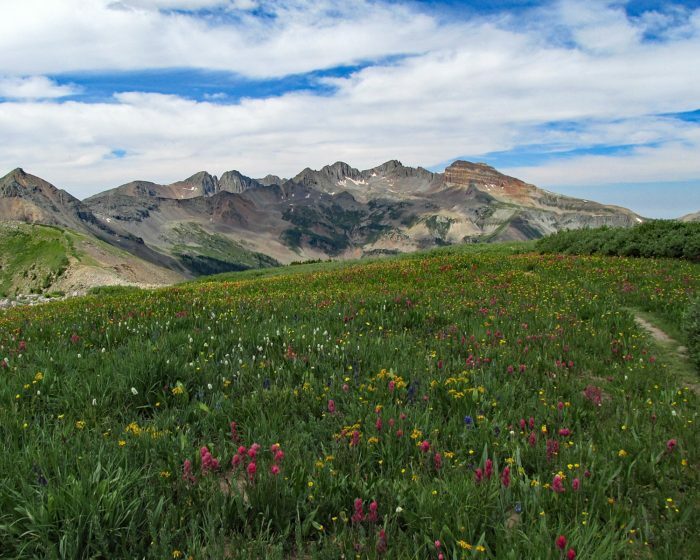 They have a legal duty to protect the wilderness from overuse and want to provide access to a true wilderness for those that do receive a permit. Based on my hike, the existing quota system seemed to result in a quality experience. While I was not always alone, the trail was not crowded and I always found a good spot to camp. That does not makes getting the permit any easier, however. You’ll need to plan ahead, yet be very flexible. After multiple unsuccessful attempts to secure a permit from the starting point (Happy Isles), I changed my approach; literally. Scoring a permit from Tuolumne Meadows, I arrived at Yosemite early and used the free bus service that runs throughout the park to day hike the 20 mile section I would have otherwise missed. 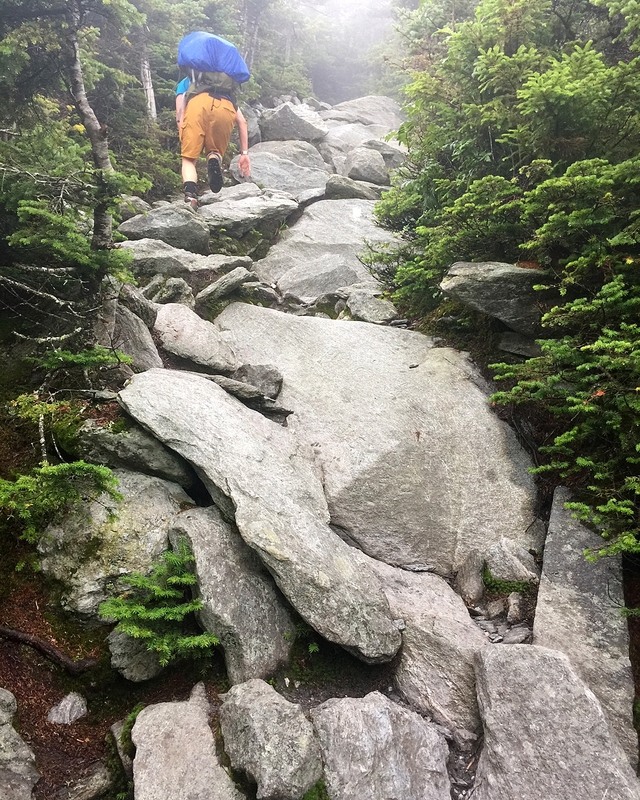 It certainly wasn’t the perfect way to do it, but I’d rather have walked the entire trail “imperfectly” than not do it at all. So, if the logistics of a 2,000 mile hike are impossible for you this year, don’t fret. There are viable options to have a life changing experience without abandoning the life you already have. These shorter options are achievable, yet still epic. Fair warning though. 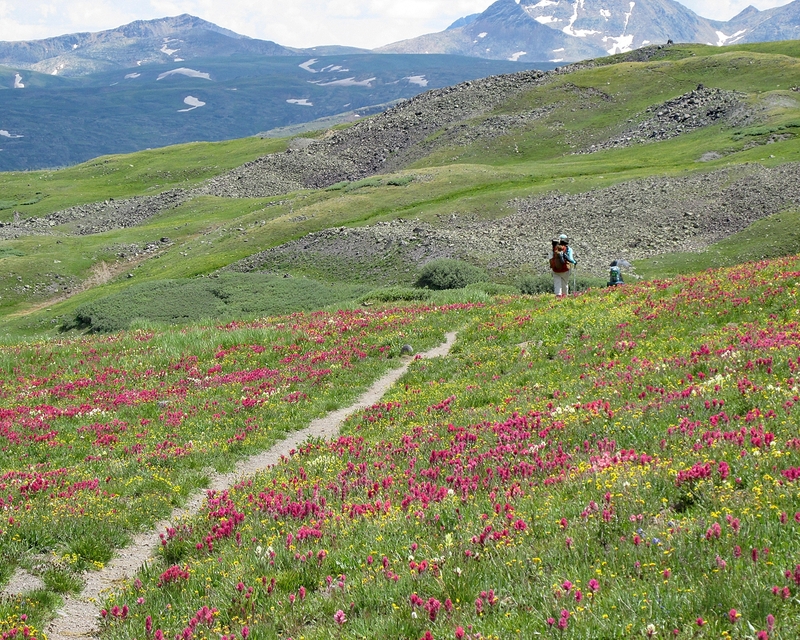 Once you pick one and hike it, your bucket list may get longer. Perhaps it will even include the Triple Crown; just a Junior Version. There are Guthook phone Apps available for all three trails. Additional planning information that I found useful can be found at websites from the Colorado Trail Foundation, Green Mountain Club and the National Park Service. In addition, there are many books written about each trail and one about all three that I’m rather partial to. We could call it the Triple-Tiara? I always thought of it as the Junior version and the friendly folks at The Trek liked the Mini Version. Triple Tiara actually makes a lot of sense though. Might be the best way to describe it. Coup over at My Trails Co, formerly GoLite has dubbed this Mini Tripple Crown as “The Tripple Gem”. I pretty sure in the early 2000’s he did a calendar triple Gem When he set his unsupported FKT of the Colorado Trail. I think another note worthy up and coming Gem that is on my list is the 700+ mile Oregon Desert Trail and the 190+ Mile Cohos Trail in NH. I’ll have to check those out. A couple I’m looking at now are the Superior Trail (255 miles in MN) and the Arizona Trail (800+ miles in well, you know).